I'm in the process of moving student houses and as I go into my third year, I've decided to down size on everything that I own including makeup. Whilst doing this, I've rediscovered some old favourites, most of which are in the eyeshadow department. Since owning the ABH Modern Renaissance palette I haven't really used much else shadow wise but that is all about to change because these rose gold/gold beauties are incredible. First up we have the NAKED 3 palette, this will always hold a special place in my heart as will the original NAKED palette as its how my makeup obsession began. This palette is the rose gold palette of dreams, each pinky, dusky, silvery shade is beautiful. As with all UD shadows they are very highly pigmented, some of these shades have a lot of fall out but still pack on the colour and blend out like a dream. I find myself using all the shades in the palette bar the darkest one as it isn't for me, the shades are perfect to use when you have a wedding as they compliment any outfit really well. I haven't bought anything from UD in forever and the new Heat palette is gorgeous but I'm not sure how it would look on my skintone, even after seeing a couple of videos. I am very torn on whether to purchase it or not, are you considering it/have you got it? The next shadows that I have been loving are the MAC pigments, I received these two as part of a set for Christmas. Why have I never tried pigments before? They are so versatile compared to shadows, using them wet or dry to achieve different looks and the for glitters such as these they are so much more intense. 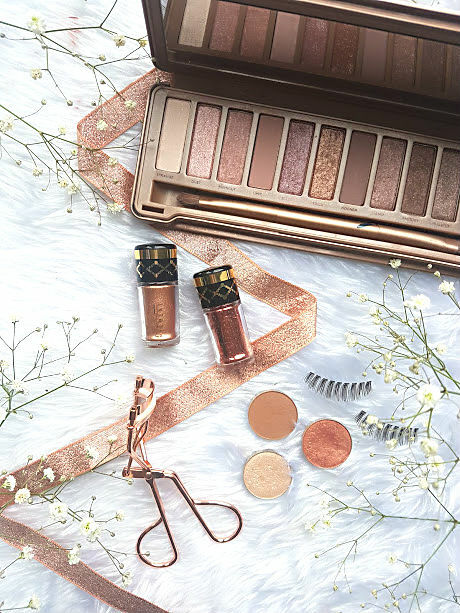 I love using all of them in the set but the two that work better for me are the copper toned ones, they make great shades for everyday wear (time dependent) and for a evening out to add some extra sparkle to your eyes. Word of warning, they are very messy to use, the packaging is pretty lousy and when you try to tip out a little bit into the lid, everything falls out together. Makeup Geek shadows are just as swoon worthy as the more expensive shadows that are available to buy. Marlena the brains behind MUG knows her stuff, each product she creates and produces she takes time in doing. No, this post is not sponsored I just love the woman. She is so driven and dedicated, I am excited to try more from her range in the future. In the mean time, these shadows (shimma shimma, frappe, cosmopolitan) are incredible. All pack a lot of pigmentation, blend beautifully and you find that they work well other shadows too when layered together. I find that her matte shadows are the best for using in the crease, blending other shadows together and deepening the outer corner. They are just so buttery and amazing, I don't have a bad word to say! It seems to me that tidying up my makeup wasn't a bad idea at all and these beauties were worth coming across again! Have you rediscovered any products lately?